Warrington suffered a third straight heavy defeat as Danny Brough's return from suspension inspired Huddersfield. Coming on top of a 38-12 home defeat by Salford and the 40-0 loss at Leeds, Wire conceded another eight tries. After first-half tries from Ollie Roberts, Jermaine McGillvary and Aaron Murphy, the Giants scored twice more within seven minutes of the restart through Paul Clough and Jordan Turner. Jake Mamo crossed too before McGillvary and Murphy each added a second. Mamo also had two tries chalked off, with Warrington's only response coming through a Tom Lineham try on 53 minutes. 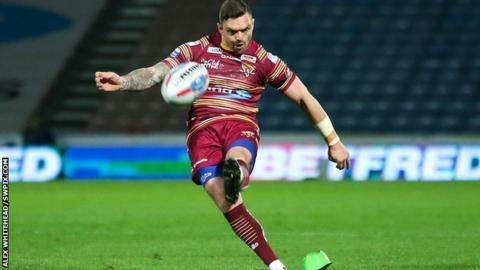 Former Salford, Hull and St Helens utility back Turner scored on his debut as Huddersfield's third victory in five matches moved them within a point of Catalans Dragons, who they face next Saturday. Turner, who joined from Canberra last week, was one of two changes, coupled with the key return from a two-match ban of half-back Brough, who kicked five goals. Warrington have now failed to win any of their last four games - and last season's beaten Grand Finalists remain in danger of finishing in the bottom four. This was Warrington's third game in nine days, while the Giants had enjoyed a nine-day gap since their last fixture. The Rugby Football League allowed last Monday's game with St Helens to be postponed as it clashed with co-tenants Huddersfield Town's Championship play-off final at Wembley. On not using tiredness as an excuse: "Let's not start that debate. I don't want to go and make excuses. We had two matches last weekend. That was obvious. "I said what I needed to say last week and the whys and what-fors but well done to Huddersfield. They were the better team and I would rather say that and congratulate them than take anything away from their performance. "If you are a Warrington fan at the moment, it's tough to watch. It's tough to participate in as well. It's hurting the boys. We haven't really recovered since Magic Weekend and it's damaged our confidence." "We probably played too many errors in the second half and played a bit like the Harlem Globetrotters at times which frustrated me a bit but it was good to see them enjoy going in front and going in for the kill a little bit. "I know Warrington are down a little bit on troops and they are a bit banged up with the short turnaround but I suppose through this year we have had plenty of that ourselves so it's good to see us take advantage of an opportunity for a change. "We probably just gave something back towards our home crowd. We haven't been good to them this year. We have disappointed them several times. Hopefully they walked away with a smile on their face." Huddersfield: Mamo; McGillvary, Cudjoe, Turner, Murphy; Brough, Gaskell; Ikahihifo, Leeming, Rapira, Roberts, Ferguson, Hinchcliffe. Replacements: Wakeman, Clough, O'Brien, Mason. Warrington: Penny; Russell, Ratchford, Atkins, Lineham; Brown, Patton; Hill, Dwyer, Cooper, Jullien, Hughes, Westerman. Replacements: Sims, Savelio, Philbin, Smith.